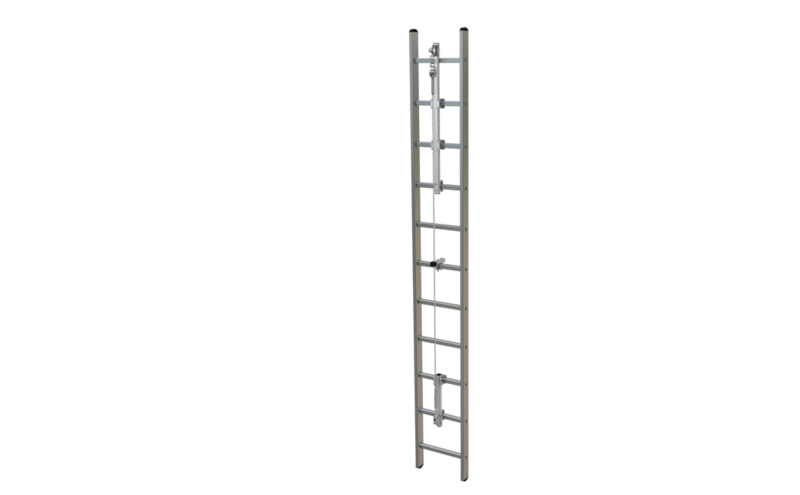 This stainless steel vertical lifeline system is designed for permanently-installed, standard ladders made of steel or aluminium (welded-on or crimped rungs) and is simply clamped onto the rungs of your ladder. We also offer an optional model with a longer protrusion (130 cm) which allows the user to climb on and off safely. Safe right to the very last rung: Our ABS SafetyHike system is a fall protection solution with an integrated vertical rope guide. With its practical rope glider and easily traversable intermediate brackets, this system is a synonym for ultimate safety on permanently-installed vertical ladders. Compared to other vertical lifeline solutions, our ABS SafetyHike offers one decisive advantage: The upper end can be equipped with a 130 cm-long protrusion module. This guarantees that you can get on and off safely. Our ABS SafetyHike is screwed straight onto the ladder which saves drilling into the facade. This vertical lifeline system is manufactured from stainless steel and fulfils the requirements set down in the PPE directive. It has been licensed and tested in accordance with EN 353-1 and RfU 11.073 ("Recommendations for Use") published by the Vertical Group (VG11). Each vertical lifeline glider secures 1 individual. A total of up to 4 individuals can use the system at any one time.